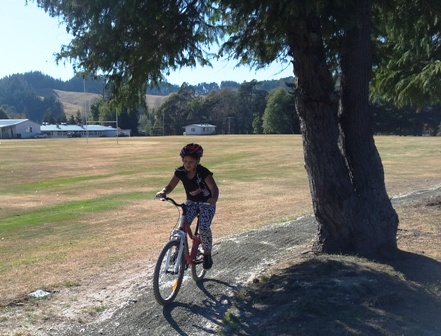 Today was the official opening of the bike track at Tongariro School in Turangi. This project which caters for all the children from year 1 through to year 13 was made possible thanks to a lot of hard work by school staff and Bike Taupo. The project received funding from the Local Community Board and Toi Te Ora Public Health Service. The weather was perfect and after some very sincere (and funny) speeches the track was blessed and the students got to ride their new bike track for the very first time. It was good to see a number of teachers also riding the track. Along with the track the school has a fleet of new bikes, a set of helmets and a excellent bike storage shed.